Digging the stump from the ground may be difficult depending on the size of the stump, but it is the most thorough method of stump removal. Break up the roots to free the stump from the ground as you dig. Use a variety of tools such as shovels, garden-hoes, pick axes, or digging bars to break up the soil. Roots can be cut with a sharp spade shovel or a root saw. This method works best on smaller stumps with a shallow root system. First, contact your local township to ensure burning a tree stump is legal in your area. 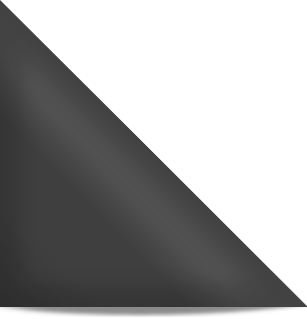 Prior to lighting the fire, clear any flammable material from the general area. It may also be a good idea to surround the stump with chicken wire. Stack wood around the stump, forming a cone-like teepee. After lighting the fire, gradually add more wood to keep the fire burning. The stump will take several hours to burn and may even continue to smolder for several days. 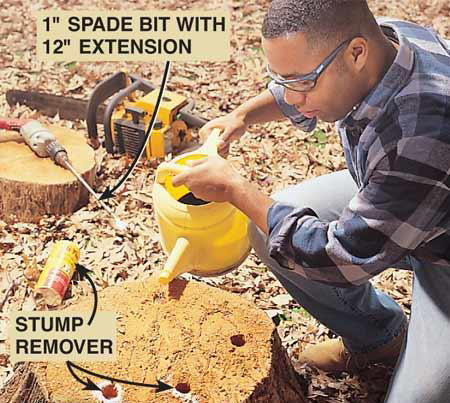 If possible, use a 1-in spade bit with a spade bit extension to drill holes at least 3-in down into the stump prior to setting up the kindling and lighting the stump on fire. 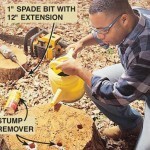 If enough of the stump is exposed from the ground, it would be beneficial to also drill holes around the perimeter of the stump, connecting these holes with the holes drilled down into the top of the stump. These will enable to stump to burn faster and more easily. To further speed up the process, you may add kerosene or fuel oil (never apply gasoline) to the holes. Wait a week or so for the fuel to be fully absorbed into the wood before lighting the fire. When the stump is completely burned, fill the hole with soil as needed. You may need to break up and remove any remaining roots with a shovel. 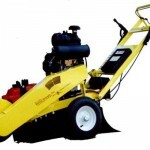 Stump grinders can be rented by the day from a machine rental house. Always follow the manufacturer’s instructions. 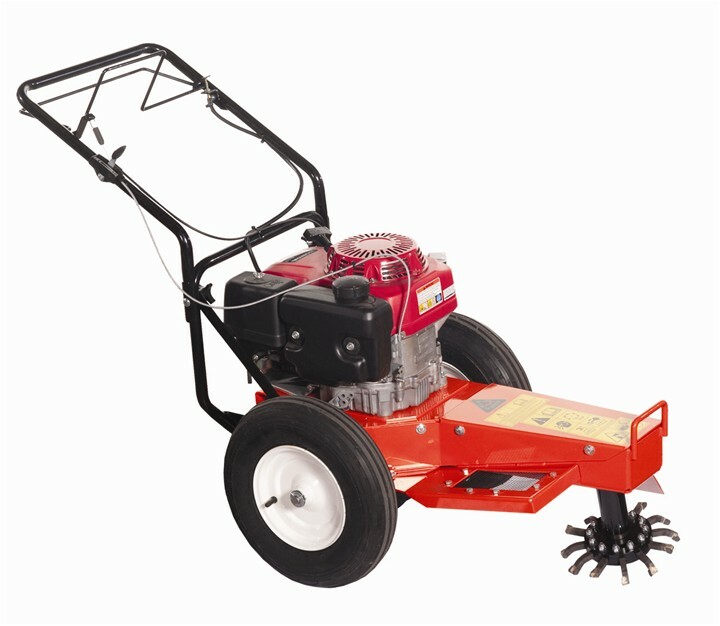 Clear the area around the stump (stones and other hard objects that might damage the stump grinder or hurt you). 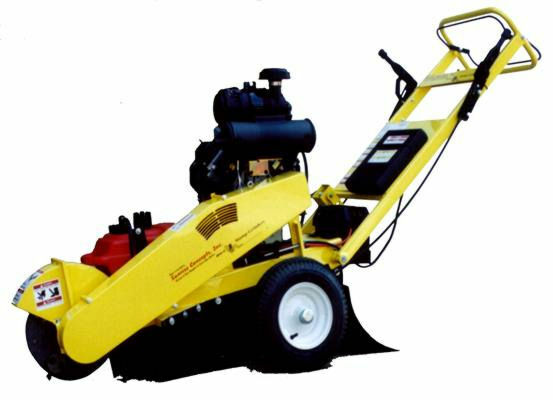 Position the stump grinder appropriately before turning it on, then gradually lower the stump grinder until it begins grinding the stump. Never force the stump grinder into the stump. 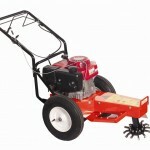 Gradually move the stump grinder around the entire surface of the stump and grind the surrounding surface-roots as well. Use a shovel to dig out the wood chips and refill the resulting hole with soil. 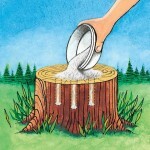 A high-nitrogen source, such as powdered potassium nitrate, can hasten the stump’s decomposition process. 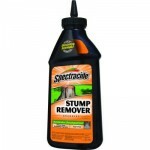 This will soften the stump more quickly so it will be easier to chip away and remove. Follow directions on your stump-remover. This will involve either treating the entire surface of the stump, drilling holes around the living portions of the stump to be filled with stump remover, making notches with an axe that will be filled with stump remover, etc. You may also be instructed to pour hot water into the holes filled with stump-remover. It may be necessary to cover the treated stump with plastic in order to keep the chemical treatment undisturbed by rain. 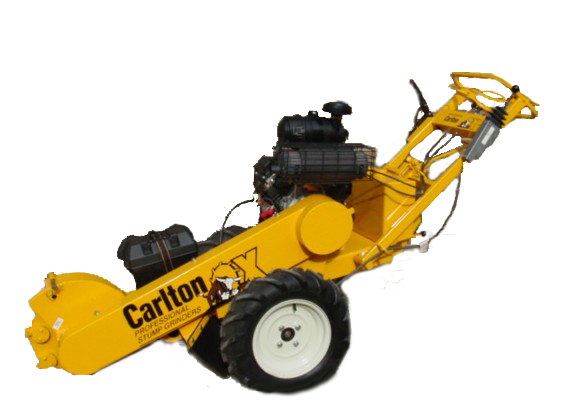 Stump removers are much more effective from fall to winter as opposed to spring through summer and works best when applied to fresh stumps. 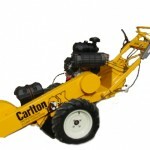 One type of stump remover. Pouring stump remover into holes drilled into top of stump. Pouring hot water into holes filled with stump remover. Building/relocating a compost pile on top of the stump is a fantastic way to speed up the stump’s natural rate of decay. Decomposition can be hastened further by keeping the compost pile moist at all times. Nitrogen-based fertilizers may also be added to the pile to speed up the rate of decomposition. As the stump decomposes over time, it can be chipped away. Put a planter box over the stump and plant something inside. You might even forget it’s there. 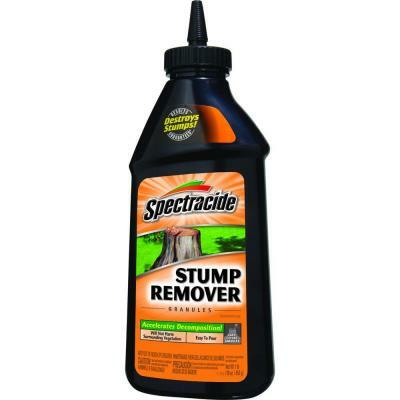 This tip is best for those wishing for the stump to decompose naturally or for those who are planning on having it removed in the future but would like to get it out of sight until then. Some people suggest fastening one end of a chain to the stump and another end to the back of a pickup truck. The truck is then used to pull the stump from the ground. This may seriously damage your vehicle and is not recommended.